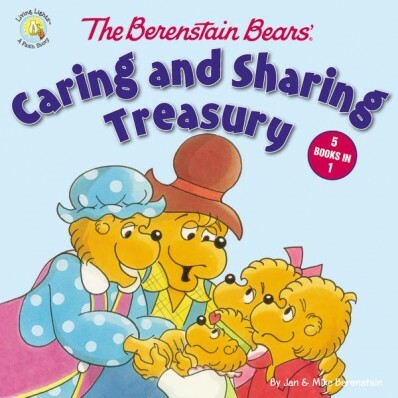 Book Review: The Berenstain Bears "Caring and Sharing Treasury"
You all know I love these books and this is a great deal! 5 books in a hard cover book and on Zondervan it is only $10.99! That is a great price! What a deal!! Thanks Zondervan for sending me this book free of charge in exchange for an honest review. I was not paid for this review and all opinions expressed are 100% mine. I really love the "Gossip Gang" story along with "The Biggest Brag." The lesson in the story was absolutely perfect for my kids to be hearing and discussing with me. If you have read any of my other Berenstain Bear book reviews than you know how much I do like them. I like how they always have topics that are relevant and important for us to sit and talk with our kids about. I like how you read the story and kids start making connections to their own life about things they have done in the past! If you haven't ever read one of these books get your hands on this 5 in 1!